I’ve been making an effort to try and eat more fish lately because it doesn’t actually happen very often. I’m aiming for 1-2 times per week and so far, so good. 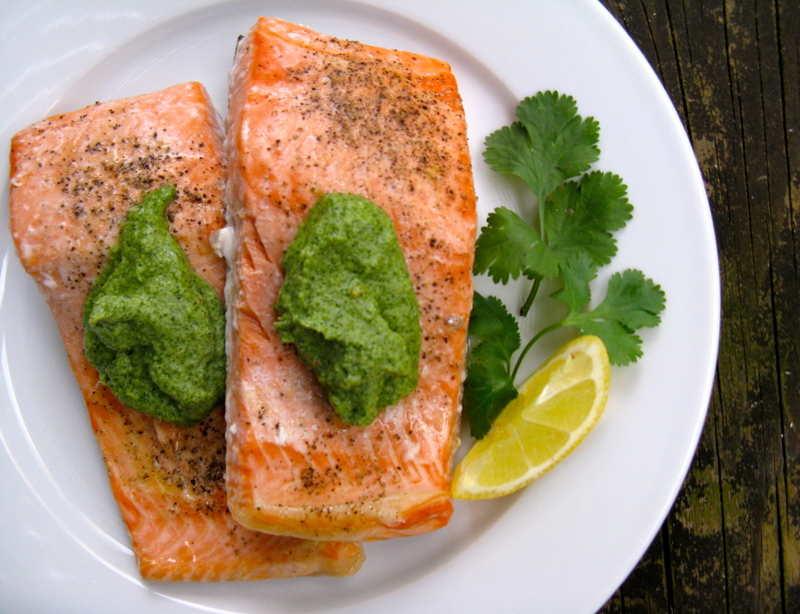 Recipes like this salmon with parsley pesto cream sauce help too! I guess I don’t eat it much because It doesn’t always taste good to me, and I really have to be in the mood for it, unless it’s Loki Fish Co. smoked salmon. I love that stuff and can eat it much more often. Again though, it’s still expensive. I think fish is much more enjoyable when it has a sauce, nut crust or glaze (remember my honey-lime glazed salmon? ), so naturally, I whipped up a sauce. There will be leftover sauce, so feel free to mix some into warm zucchini noodles. It’s delicious, creamy and dairy-free. Place fish fillets skin side down in the pan. Sprinkle with sea salt and pepper. Then, dot half the butter on one fillet and half on the other. Then, squeeze 1 tsp lemon juice over each. Bake for 15-18 minutes or until fish is cooked through. 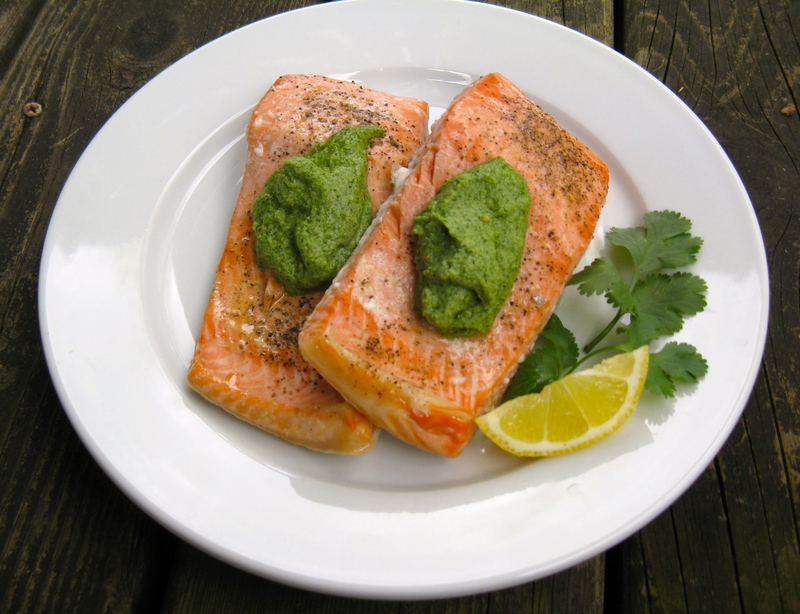 Serve with parsley pesto cream sauce on top. Combine all ingredients in the food processor or a high-powered blender (I actually used my new Ninja Master Prep Pro System for this one!) and blend until smooth. Taste and adjust seasonings and olive oil quantity, if need be. Cream should be somewhere in the middle between thick and runny. Looks delicious! I wanted to make a fish dish this weekend I might give this a go 🙂 Have fun ring shopping! Thanks, Naz! I’m super excited!! Looking forward to reading about how you get along 🙂 Are you ring shopping for both of you? Yes, ring shopping for both! Oooh pinning this! Tried salmon twice in the last month, and the first time in my life, so really keen for good recipes to make myself! Thanks! I hope you enjoy it whenever you choose to make it! Thanks, Ashley! That means a lot coming from you — someone who is so savvy at flavor profiles and combinations. I usually just guess on things that will taste good together (maybe you could teach me a thing or two)! I actually like dill, but had fresh parsley and cilantro on hand, so went with that (I also figured it’d taste fine with the salmon). To be honest, I never really have fresh dill on hand though, unless I’m buying it for a specific recipe.